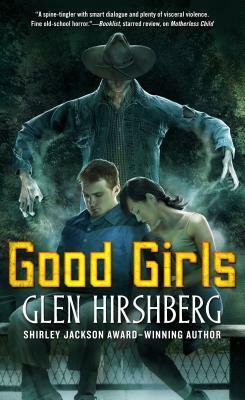 Three-time International Horror Guild and Shirley Jackson Award Winner Glen Hirshberg brings his flair for the grim, grisly, and emotionally harrowing to Good Girls, the standalone sequel to Motherless Child. Still in college, Rebecca is the "responsible one." She keeps her friends from getting too crazy--though Human Curling is kind of out there. She's a safety valve for Joel, her foster father, and helps out at Halfmoon House, which he runs with his wife, Amanda--Rebecca's foster mother, who makes sure her children able to protect themselves. To take care of themselves. Mostly Rebecca takes care of everyone else. She works at the university's crisis center, doing whatever she can to help the troubled souls who call the hotline. Until the night he calls. Jess has lost so much: her job, her home...her daughter Natalie, no longer human thanks to the creature who called himself the Whistler. She tried desperately to save Natalie, but in the end, Jess herself pulled the trigger and killed her child. Natalie's best friend, Jess's almost-daughter, and a mother herself, though her son is dead. Sophie's alive but not alive--half-mad, half vampire, half a person...and Jess's responsibility. GLEN HIRSHBERG won the Bennett Cerf Prize for Best Fiction at Columbia University. He's won the Shirley Jackson Award and three International Horror Guild Awards. Hirshberg has been a five-time finalist for the World Fantasy Award as well as a finalist for the Bram Stoker Award. One of his story collections, The Two Sams, was named a Best Book of the Year by Publishers Weekly. His novels include The Snowman's Children, The Book of Bunk, and the first book in the Motherless Children Trilogy, Motherless Child. More than a decade ago, Hirshberg co-founded the Rolling Darkness Revue, a multi-media experience which incorporates theatrical lighting and live music to illuminate and enhance the Halloween tradition of ghost story readings. Hirshberg continues to perform in the Revue, which is staged each October in the Los Angeles area. Glen Hirshberg and his family live in Los Angeles, where he teaches high school.